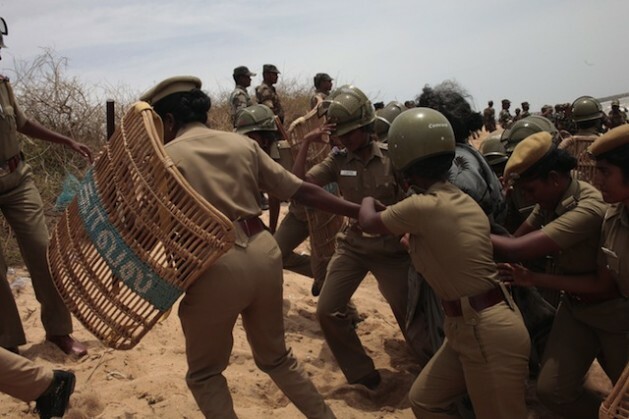 Crackdown on women protesters against the Kudankulam nuclear plant in India. Credit: K. S. Harikrishnan/IPS. KUDANKULAM, India, Feb 3 2013 (IPS) - An indefinite struggle continues against the Kudankulam nuclear power plant in the southern Indian state Tamil Nadu despite a government crackdown on protests. Idinthakarai, a village in Tirunelveli district of Tamil Nadu, has become the hub of a mass agitation which started on Aug. 16 in 2011. Hundreds of men, women and children from a group of 12 villages are leading a campaign to stall operation of the nuclear plant. The public agitation intensified after the disaster at the Fukushima nuclear plant in Japan. The villagers say they have been facing false propaganda through the media, foreign money, threats from goons, prohibitory orders against meeting in public places, harassment from officials, abuse from policemen, cases of sedition in courts, and arrest warrants. The movement has become a major headache for the government, S. P. Udayakumar, leader of the People’s Movement Against Nuclear Power (PMANP) told IPS. The sit-in-protest at Idinthakarai has now continued more than 500 days. Fearing constant snooping by the national intelligence agencies and arrest by the Tamil Nadu police, the front leaders of the PMANP are staying at undisclosed areas. The backbone of the Kudankulam agitation are the fishers, who believe that the plant is a threat to their livelihood. Women have been particularly active in the protests. “Even though police are continuing their threats, women protesters are going to every house to canvas people,” said Balammal from Chettikulam village. On Aug. 13 last year, children marched to the district collector’s office and complained that the Nuclear Power Corporation of India has not followed disaster management norms in the construction of the plant. “We strongly oppose the plant which will destroy our coming generation,” Arun, a ten-year-old boy told IPS. Teachers say anxiety has crept into schools. “They have strong views against the plant. The stress has affected a few students’ performance in the examination,” said a teacher at the St.Annes Higher Secondary School at Kudankulam. Gopal, a young protester from Kuttappilli village, said that some who are protesting today were the children who participated in the agitation in 1988 when India signed a pact with erstwhile Soviet Union to construct a nuclear plant at Kudankulam. Protesters recognise their limits. “We are ordinary people and hold strong peaceful protests, but we cannot do much to oppose the establishment,” said Udayakumar. International researchers into the health effects of radiation say the protest is justified because of geographical factors. V.T. Padmanabhan, well-known scientist and member of the European Commission on Radiation Risk, points out that the power plant is situated on a volcano site. The agitation has won wide support from environmentalists and independent groups from the neighbouring states Kerala and Karnataka. The commissioning of the 2000 MW nuclear power plant at Kudankulam has been delayed due to undisclosed technical problems. Chairman of the Atomic Energy Commission R.K. Sinha has said there is no major issue behind the delay. But he declined to give any specific date for commissioning.